And though you don’t see them in my sketch (except three), I sense their proximity, energy and camaraderie even as I write this. Sketching this building was the last event on the last day of Urban Sketchers Symposium held in the last week of July. The late afternoon’s humidity was tinged with the bittersweet feeling of relief and impending gloom. After 3-days of intensive sketching, art workshops and activities we were going to have our lives back. But the little bubble inside which we hung out with artists from around the world, sketched and played with paints from dawn till dusk, drew our food till it went cold, had nerdy discussions about art supplies and perspectives without anybody leaving the table, went giddy with excitement when shaking hands with our favourite artists and most of all got inspired and set lofty goals for ourselves a million times in a day would burst and the withdrawal symptoms would kick in. But before all that happened, I was sketching SAM with 400 artists. We were like a full blown symphony orchestra sitting on low stools or plonked on hard concrete, each playing our own instrument, deftly, looking from time to time at the conductor in front of us for cues and making art together. That in itself was a pretty incredible feeling! 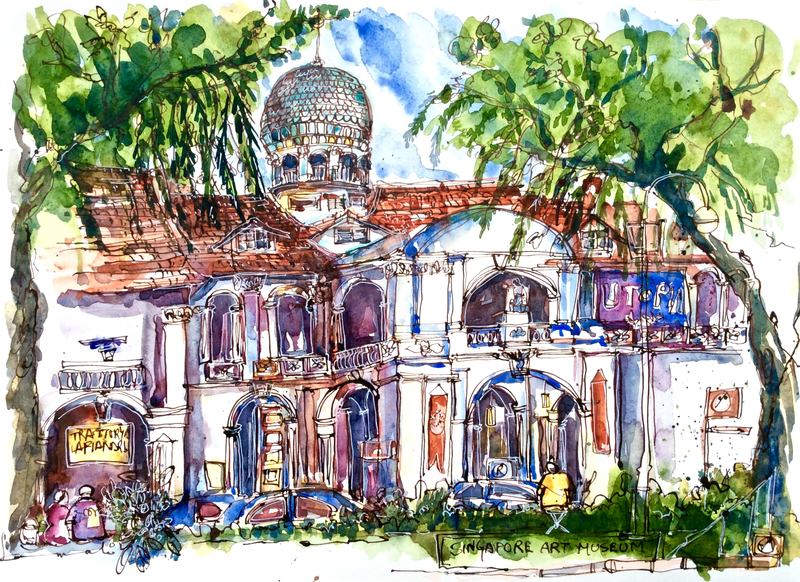 This entry was posted in Daily Vignettes and tagged drawing, illustration, SAM, Singapore, Singapore Art Museum, Urban Sketchers Symposium Singapore, urban sketching on September 2, 2015 by Somali Roy. Well done! Love your style! Thanks so much! I love your photos and travel stories! Have been reading for a while now. Oh that’s great to hear! Glad you like too 🙂 I love to travel, write and photograph!